NOTE: Every claimed source needs a cross-reference link; claimed sources need to be plausible, not horrendously obscure; default costumes usually don't need descriptions since they are not alternate costumes; returning costumes original to Smash do not need references to their appearances in previous Smash games. 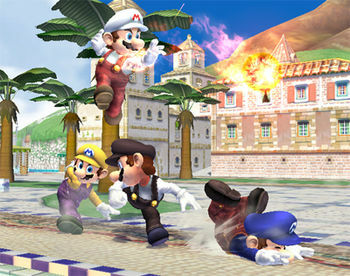 A battle between four Marios, each one in different colors. Masahiro Sakurai referred to the implimentation of costumes as "one of the joys of Smash". Players can pick different alternate costumes for their character by cycling through a list of up to six choices. The buttons used to cycle are 1/2 for the Wii Remote and Nunchuk combination, A and B for the Wii remote alone configuration, and pressing X/Y for the Classic Controller and GameCube controller. Most characters have six alternate costumes, though Jigglypuff, Lucario, Pokémon Trainer, and Sonic only have five, and Pikachu has only four. Wario has two costumes with six choices each, doubling his options and giving him two different outfits for each team in Team Battles. Some characters, namely Lucario, Pokémon Trainer, and Sonic, have sets of alternate costumes that can be difficult to distinguish from each other in a match. As such, tournaments have the "colorblind rule" in doubles matches, where a player can choose which colours their team and their opponents' team are, if either team has one of the aforementioned characters on their team. While texture hacks are usually discouraged from being used in tournaments, if not flat-out disallowed, it is usually acceptable to use simple texture hacks on these characters to make the color difference between their team palettes more obvious. When selecting characters in tournament mode, instead of displaying the character's colored image of the chosen costume, a colored bar is displayed in the player list. This color is usually an intuitive indicator of which costume has been chosen, but there are several cases where costumes are given strange colors, such as giving cyan to Ike's default blue-brown getup, or using orange or yellow when the opposite is clearly more correct. In Wi-Fi, Tournament and Team Brawls, if two identical characters share the same alternate costume, the second character will have a lighter tint in their appearance. A third character on the same team uses a darker tint. The fourth character's tint is even darker than the third character's. It is generally quite difficult to distinguish from the third character's color scheme. The order of the palette swaps for each character are sorted in the order in which they appear on the character selection screen. R Resembles one of his alternate colors in Mario Golf. B Resembles his original design in Super Mario Bros. Resembles Morton's original design from Super Mario Bros. 3 and Super Mario World. Based on Boom Boom's appearance in Super Mario Bros. 3. Based on his appearance in the Japanese commercial for F-Zero X.
R Based on Blood Falcon, Captain Falcon's clone and rival. It is Captain Falcon's only costume with a unique logo on the back: a skull with "Blood Hawk" (the name of Blood Falcon's vehicle) written underneath. B Resembles his appearance in the original F-Zero and in F-Zero: GP Legend. Resembles Jody Summer's original appearance in F-Zero X. The vest is reminiscent of Diddy Kong's alternate outfit in Donkey Kong Country's Two-Player Contest mode. Resembles Dixie Kong, Diddy Kong's girlfriend. Resembles his appearance in Donkey Kong Country 2: Diddy's Kong Quest's Two-Player Contest mode. G Resembles one of his alternate costumes from Donkey Kong 64's Multiplayer Mode. B Resembles Kiddy Kong, Dixie's partner in Donkey Kong Country 3: Dixie Kong's Double Trouble. Resembles a gorilla. The tie is reminiscent of Donkey Kong's appearance in Donkey Kong Country's Two-Player Contest Mode. R Resembles the original D.K. from Donkey Kong. B Resembles one of his alternate costumes from Donkey Kong 64's Multiplayer Mode. It also resembles one of his alternate colors from Mario Golf. G Resembles one of his alternate costumes from DK: King of Swing. Referred to as "Yeti DK" on the Brawl DOJO!!. Resembles the mythical yeti. It also resembles the Fire Mini Donkey Kongs from the Mario vs. Donkey Kong series and Eddie the Yeti from the Donkey Kong Country TV series. Based on his appearance in Star Fox Command. Resembles Katt Monroe, Falco's love interest, as she appears in Star Fox Command. B His clothing is reminiscent of an Arwing. R Resembles his appearance in Star Fox: Assault. Complementary to Fox's "Dark Fox" costume. Resembles a black pheasant or raven. Referred to as the "Dark Fox" on the Brawl DOJO!! It resembles a black fox. R Resembles his Player 1 costume from Star Fox: Assault's Versus Mode and Falco's appearance in Assault. B Resembles costume 3 from the original Super Smash Bros.
Based on his appearance in The Legend of Zelda: Twilight Princess. Complementary to Link's "Dark Link" costume. Resembles his appearance in The Legend of Zelda: Ocarina of Time. Popo and Nana switch positions for their red, black, and white costumes, and their head icons change to match, but they do not switch positions on the selection screen like they did in Melee. R Nana resembles her appearance on the American boxart for Ice Climber. The colors of their mittens match those of their default colors. The parka color resembles their sprite after touching an enemy. Based on his appearance as a Ranger in Fire Emblem: Path of Radiance. B Resembles Sigurd, one of the protagonists in Fire Emblem: Genealogy of the Holy War. G Resembles Geoffrey, one of Ike's comrades, as he appears in Path of Radiance. Referred to as an "ordinary soldier" on the Brawl DOJO!! R Its hibiscus is reminiscent of Phoebe, a member of the Elite Four from Pokémon Ruby and Sapphire. Its hat is reminiscent of Leaf, the female protagonist of Pokémon FireRed and LeafGreen. B Resembles one of the possible colors for a nicknamed Jigglypuff in Pokémon Stadium and its Shiny coloration. Its hat is reminiscent of the Bug Catcher Trainer class. 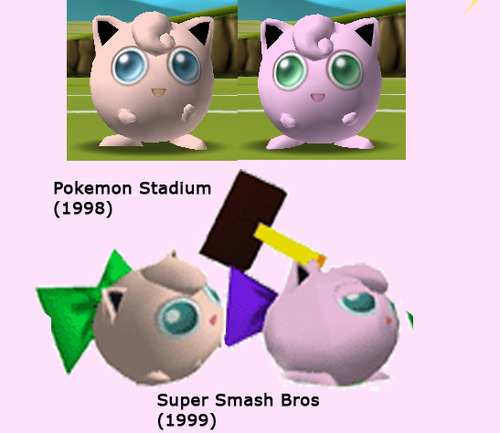 G Resembles one of the possible colors for a nicknamed Jigglypuff in Pokémon Stadium. Its cap is reminiscent of Sleep Kirby. Resembles one of his alternate colors in Kirby 64: The Crystal Shards' Multiplayer mode. G Resembles one of his alternate costumes in Kirby Air Ride.. Resembles one of his alternate costume in Kirby Air Ride. The obi is reminiscent of formal Japanese kimonos. B The obi features the same icons as one of the menu schemes from Kirby 64. Resembles his appearance on the monochromatic Game Boy screen in Kirby's Dream Land. All these colors are also similar to different Kirby colors in games such as Kirby Air Ride and Kirby & the Amazing Mirror. They are all also usable in Kirby: Squeak Squad, where color variations are distinct and each have their own names. Based on and directly referred to as "Keeby" from Kirby's Dream Course. It also resembles Yellow Kirby from various Kirby titles and Beam Kirby in Kirby Super Star. B Based on Ice Kirby in Kirby Super Star. It also resembles Blue Kirby from various Kirby titles. R Based on Fire Kirby in Kirby Super Star. It also resembles Red Kirby from various Kirby titles. G Resembles Green Kirby from various Kirby titles and Plasma Kirby in Kirby & The Amazing Mirror. Resembles his monochrome appearance in Kirby's Dream Land. It also resembles his appearance on the North American box cover. G Based on his appearance from The Legend of Zelda: Twilight Princess. R Based on the Goron Tunic from The Legend of Zelda: Ocarina of Time. It also resembles Link's tunic with the Red Ring equipped in The Legend of Zelda. B Based on the Zora Tunic from Ocarina of Time. Based on his tunic with the Blue Ring equipped in The Legend of Zelda. Resembles Link's appearance after utilizing the Great Fairy's Tears in Twilight Princess and an unused yellow tunic from Ocarina of Time. Based on Dark Link. Resembles the Dark Interlopers from Twilight Princess. Resembles Claus, Lucas's twin brother. B Resembles Ness's pajamas in EarthBound. Resembles Mario's appearance on the boxart for Pinball, although Luigi's cap is orange instead of blue. R The original Super Smash Bros. website referred to this costume as "Strawberry Luigi". It resembles his appearance in Wrecking Crew. B Resembles Mario's appearance on the American boxart for Mario Bros.
B Based on his appearance on the Japanese boxart of Famicom version of Mario Bros., which itself is based on his appearance in the arcade version of Mario Bros.
Based on Wario's classic design. Based on Foreman Spike from Wrecking Crew, though the palette has become more monochromatic since its debut in the original Super Smash Bros.
G Resembles his appearance on the Japanese boxart for Wrecking Crew, but with the overalls being more brown. R Resembles the overworld sprites of enemy units in the Fire Emblem games. G Resembles the overworld sprites of allied units in the Fire Emblem games. Resembles Leif, the protagonist of Fire Emblem: Thracia 776. B Resembles his appearance in Fire Emblem: Mystery of the Emblem. Resembles one of his alternate costumes in Kirby Air Ride. R Resembles one of his alternate costumes in Kirby Air Ride. G Resembles one of his alternate costumes in Kirby Air Ride. B Resembles his original appearance in Kirby's Adventure, but with red eyes. Resembles one of his alternate costumes in Kirby Air Ride, as well as Kirby. Resembles the characters from the Game & Watch games Fire and Parachute. He has the general color of the LCD frames in most of the Game & Watch handhelds. R Reminiscent of characters and objects as depicted on the Virtual Boy. Reminiscent of characters and objects as depicted on the original Game Boy. Reminiscent of the backlit display of the Game Boy Light. Resembles Fuel from Mother 3, but with a cap. Based on the uniforms of the Hanshin Tigers, a Japanese baseball team. The shirt's pattern is reminiscent of the Gigantic Ant enemy from EarthBound. B Resembles his younger self that he encounters briefly in Magicant. The shirt features a sprite of Mr. Saturn on the front. Resembles a Navy Mark IV space suit. B Resembles Louie, Olimar's partner in Pikmin 2. Resembles Princess Daisy. This costume is less complex than it was in Melee, as it simply changes the colors of her clothing and hair. R Resembles Pauline's original appearance in Donkey Kong. B Resembles one of her alternate colors from Mario Golf and Daisy's appearance on the title screen of NES Open Tournament Golf. G Resembles one of her alternate colors from Mario Golf and her appearance on the title screen of NES Open Tournament Golf. Resembles a wedding gown. The dress is reminisicent of the wedding dress Paper Peach wore in Super Paper Mario. 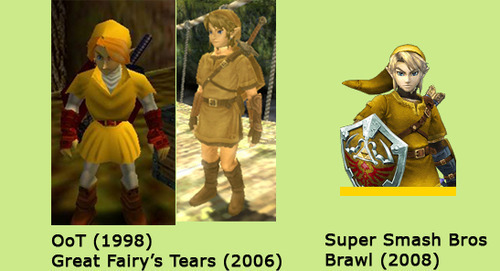 At four costume choices, Pikachu has the least amount of alternate costumes in Brawl. R Resembles one of the possible colors for a nicknamed Pikachu in Pokémon Stadium and its Shiny coloration. Its cap is reminiscent of Red's appearance in Pokémon Red and Blue. 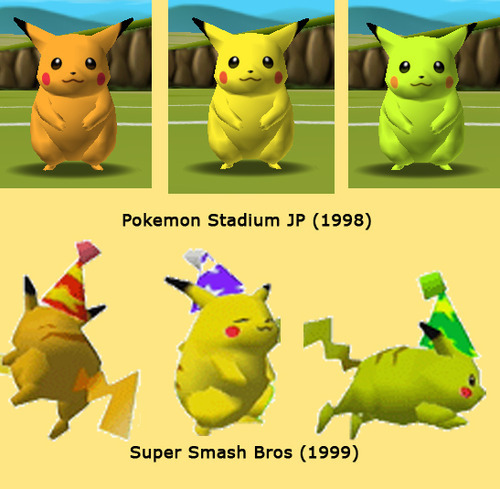 G Resembles one of the possible colors for a nicknamed Pikachu in Pokémon Stadium. Its headband is reminiscent of Brendan's appearance in Pokémon Emerald. B Its goggles are reminiscent of the Swimmer Trainer class and Pichu's Blue Team costume from Melee. R Resembles his chiton after obtaining the Gold Arrow and reaching Level 4 strength in the original Kid Icarus. G Resembles his chiton after obtaining the Bronze Arrow and reaching Level 2 strength in Kid Icarus. B Resembles his chiton after obtaining the Sacred Arrow and reaching Level 5 strength in Kid Icarus. Referred to as a "fallen angel" on the Brawl DOJO!!. It became the basis for Dark Pit. The Pokémon Trainer is based on his appearance in Pokémon FireRed and LeafGreen. R The Pokémon Trainer resembles Leaf, the female protagonist of FireRed and LeafGreen. Squirtle resembles the Pokémon Wartortle, its evolved form. Charizard resembles the Pokémon Charmeleon, its pre-evolved form. G The Pokémon Trainer resembles Brendan as he appears in Pokémon Emerald. Squirtle and Ivysaur resemble their respective Shiny colorations. B Squirtle resembles its in-battle sprite from Pokémon Yellow. Charizard resembles the Shiny colorations of Charmander and Charmeleon. R Based on the Japanese version of R.O.B. released for the Famicom - the "Family Computer Robot". Based on the western version of R.O.B. released for the NES. The text on his base reads "R.O.B. - Robotic Operating Buddy" instead of "Family Computer Robot". Resembles Spike, a glitch enemy from Stack-Up. Resembles Flipper, a glitch enemy from Stack-Up. G Resembles the R.O.B. Launcher enemy from the Subspace Emissary. Based on the Varia Suit as it appears in Super Metroid. It no longer corresponds with Samus's red team color, most likely because it is now paired with her cyan Zero Suit. B Based on the Fusion Suit from Metroid Fusion. R Based on the Gravity Suit's in-game sprite from Super Metroid, though it more closely resembles the in-game sprite of the Varia Suit in the original Metroid when missiles are selected. Based on the Dark Suit from Metroid Prime 2: Echoes. Based on the Gravity Suit's appearance in Metroid Prime. G The original Super Smash Bros. website referred to this alternate costume as "mass-produced Samus", a reference to Gundam. 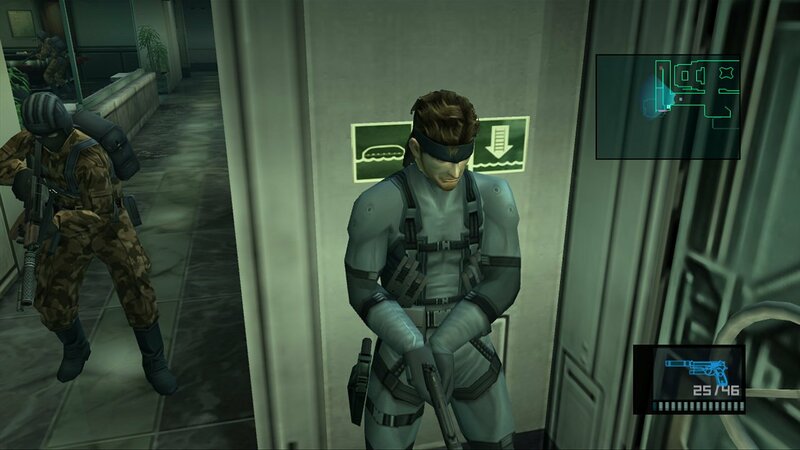 Most of Snake's costumes seem to be based on different camouflage uniforms worn by Naked Snake in Metal Gear Solid 3: Snake Eater. Based on the sneaking suit worn by Solid Snake in Metal Gear Solid 2: Sons of Liberty. R Resembles the Fire camouflage. B Resembles the Splitter camouflage. Resembles the AUSCAM Desert camouflage. G Resembles the Tiger Stripe camouflage. Sonic is the only non-Pokémon character to have fewer than six alternate costumes. Resembles the colouration of Sonic the Werehog from Sonic Unleashed. His cuffs are reminiscent of Silver's gloves. G His cuffs are reminiscent of the thumbs-up that appears in Knuckles the Echidna in Sonic the Hedgehog 2's Special Stage. R His cuffs are reminiscent of the thumbs-up that appears in Sonic the Hedgehog 2's Special Stage. G Based on his appearance in The Legend of Zelda: The Wind Waker. R Resembles Red Link from the Four Swords titles. B Resembles Blue Link from the Four Swords titles. Resembles Purple Link from the Four Swords titles. Resembles Link's appearance in The Legend of Zelda. Resembles Dark Link and the Dark Interlopers from The Legend of Zelda: Twilight Princess. Unlike all other characters, Wario has two outfits each with multiple color choices: his biker costume from the WarioWare games, which is his default costume, and his classic overalls. This doubles his alternate costume choices. There are a total of 12 costume choices for Wario in Brawl. Based on his appearance in the WarioWare series. R The red jacket, white pants, and goggles match the color scheme of Jimmy T., one of Wario's friends. G Resembles Zombie Wario from Wario Land 3. Wario's overalls closely resemble the cartoonish look in both the Mario and Wario games, in contrast to Mario, Luigi, and Waluigi, who were given more realistic-looking overalls. Based on his appearance in the Mario and Wario Land series. Referred to as "Overalls Wario" on the Brawl DOJO!!. R Resembles Mario's appearance in Donkey Kong and one of Wario's alternate colors in Mario Golf. B Resembles Mario's appearance on the Japanese boxart for Mario Bros.
G Resembles Mario's appearance on the Japanese boxart for Wrecking Crew and Luigi's appearance on the arcade version of Mario Bros. Resembles Foreman Spike, another rival of Mario's from Wrecking Crew. Resembles his in-game sprite from the early Wario Land titles on the Game Boy. Complementary to Fox's "Dark Fox" costume. Resembles a black wolf. While the portrait depicts the suit with black sleeves, they are white in-game. G Resembles his Player 4 costume from Star Fox: Assault's Versus Mode. B Resembles his Player 2 costume from Star Fox: Assault's Versus Mode. All of Yoshi's costumes are different variations of the Yoshi species in many of his games, specifically Super Mario World 2: Yoshi's Island, Yoshi's Story, and Yoshi's Island DS. The soles of his shoes, the saddle on his back, and his spines stay the same color, no matter what color he is. G Based on a Green Yoshi. R Based on a Red Yoshi. B Based on a Blue Yoshi. Based on a Yellow Yoshi. Based on a Pink Yoshi. Based on a Light Blue Yoshi. Zelda is based on her appearance in The Legend of Zelda: Twilight Princess. While Sheik does not appear in Twilight Princess, she is based on unused concept art of her from the title. R Zelda resembles her in-game sprite when Link rescues her with the Red Ring equipped in The Legend of Zelda. B Zelda resembles her in-game sprite when Link rescues her with the Blue Ring equipped in The Legend of Zelda. Zelda is based on her appearance in The Legend of Zelda: Ocarina of Time. Sheik does not resemble her appearance from Ocarina of Time and instead matches Zelda's color scheme. G Zelda resembles her in-game sprite when Link rescues her with no ring equipped in The Legend of Zelda. B Resembles the Zero Suit at the end of Metroid Prime 2: Echoes. R Resembles her leotard at the end of the original Metroid. Resembles her outfit at the end of Super Metroid. There is a glitch in Brawl that allows multiple players to be the same character with the same color scheme, without the shading seen in Team Battles. This glitch can also occur when every player selects random, and multiple players end up playing as the same character. Captain Falcon's red outfit actually has one file for each available PAL language in the game (English, French, German, Spanish, Italian). While presumably done so localizers could edit the "Blood Hawk" on the back to match the current language, this appears to have been skipped or glossed over, as there is no difference between the files. Mr. Game and Watch only has one file for his model and textures. This indicates that the color variations come from tinting or blending the textures, instead of pre-rendered bitmaps. Luigi has an unused blue costume in the game's data; this costume is slightly lighter in color than the used one, and the reason for its removal is unknown. ↑ Super Smash Bros. for Wii U (North America) - Tip: "R.O.B. : Color Variations – R.O.B. 's red-and-white second color is based on the Japan version of R.O.B. In fact, it's even his default color in the Japanese version of this game!" This page was last edited on April 24, 2019, at 16:31.